Improve performance, speed recovery and reduce muscle tension and injury by incorporating yoga, meditation, nutrition, self-care, essential oils, self-massage and stretching into your training routine. CONTACT ME to set up a private session or Team Yoga Practice. Are you an athlete that trains hard for strength and speed but rarely stretches? Do you skip stretching and grab processed convenience foods because you’re too busy to cook? If you’re feeling stiff and tight, yoga along with a super food anti-inflammatory diet can help you increase flexibility, speed recovery, reduce inflammation and lessen your chances of injury. I create customized sport-specific yoga and nutrition recovery programs to help individual athletes and teams perform at their peak. My simple, time-efficient techniques can make a huge difference in your recovery and performance. I’ve worked with the Baltimore Ravens and the University of Maryland Men’s Basketball Team and the UMBC Soccer Team. 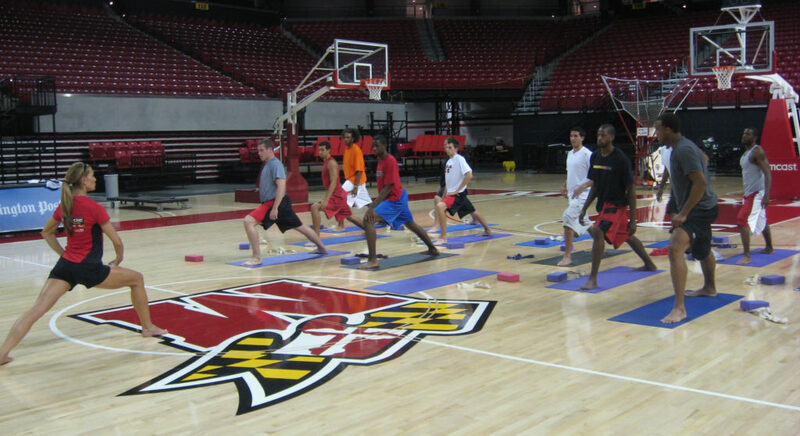 “As our program at the University of Maryland Men’s Basketball began to get off the ground we added Karen Dubs into our program to introduce a basketball specific yoga series to our players. Karen planned out a sport specific sequence of sessions for our players that consistently challenged them to become more disciplined and focused; all while improving their joint mobility, flexibility and having fun. As a team, we are better focused, running faster, reacting quicker, jumping higher and breathing more efficiently than we have ever been. Karen has played a vital role in our improvement and will continue to in the future”. Sessions are available at your school or training facility or at Performfit Sports Experience. CLICK HERE to book a team training or a customized private session.